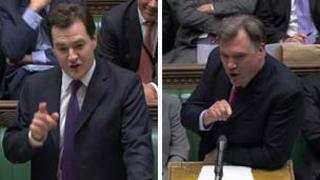 Image caption George Osborne and Ed Balls: A classic grudge match? It is customary to dig out the boxing metaphors when describing keenly anticipated Commons clashes. But the inaugural heavyweight title fight between between shadow chancellor Ed Balls and Chancellor George Osborne was more like a messy and short-lived playground scrap, complete with a gaggle of eager acolytes sat on the benches behind them, to hold the coats and shout encouragement (and throw the occasional sucker punch when Teacher Bercow was not looking). Both men were clearly spoiling for a fight and although they each began with warm words for their new opponent, as Commons custom demands, it was not long before they had their sleeves rolled up and were thrashing around in the dirt. Mr Balls, leaning with practised ease on the despatch box, began with a crack about his opponent's decision to increase the levy on UK banks by £800m to £2.5bn. "I seem to have inherited an exceptionally large number of breakfast meetings from my predecessor. Good job I didn't have one today as I would have missed this morning's rather hurried mini-Budget." He followed this with a dig about the snow - a touchy subject for Mr Osborne, who was widely mocked for using a "leaves on the line" excuse for last quarter's unexpectedly terrible growth figures. "Could the chancellor tell the House is there something different about snow in Britain? Or is there a better explanation as to why the American economy grew and Britain's economy did not?" asked Mr Balls. But Mr Osborne - who had already pre-empted this line of attack by admitting the growth figures had been "disappointing" even when the snow was taken into account - ignored the question and, instead, managed to get the first big laugh of the session with a joke about Ed Miliband. "Now both he and the leader of the opposition know what it's like to be people's second choice." Mr Balls looked daggers at the government front benches - a distance of two sword lengths to prevent assaults, lest we forget. But, being the bruiser that he is, he was soon back on his feet and launching into a sustained attack on Mr Osborne's economic record. "Can the chancellor tell the House, with consumer confidence falling, with inflation rising, with no bank lending agreement, no plan for jobs, no plan for growth, no plan B, does he really expect us to believe he can meet his forecasts for economic growth this year or will he have to stand here at the Budget in six weeks time and downgrade his first growth forecast?" This got Labour MPs cheering. Mr Osborne replied with what is clearly going to be his favourite line of attack in these encounters - that Mr Balls is a "man with a past" at the Treasury and that he was a "deficit denier". "Well he clearly had a lot of time to prepare that, but I'm not sure it all came out as he expected," replied Mr Osborne to the shadow chancellor's question. "What I would say to the shadow chancellor is this: We have had to deal with his economic legacy. And he is running away from his past. He was the City minister who knighted Fred Goodwin, he is the economic advisor whose fiscal policies led to fiscal disaster, he's the leadership candidate who for reasons of political positioning who denies the deficit. And the truth is this: We have got a plan to clear up his mess. He has no plan at all." Mr Balls returned to the snow theme with a jibe about Mr Osborne's recent skiing holiday - it was now the chancellor's turn to try out a thousand yard stare. The chancellor continued his expose of the shadow chancellor's supposedly shameful Treasury past, working in another swipe at Labour leader Ed Miliband - "the man who did the photocopying for him". And that was it - a brief taster of what pundits already believe has the makings of one of the classic Commons grudge matches. Provided they don't get detention of course.